This IBM Redbooks document describes how to plan and perform integration of the IBM SAN Volume Controller (SVC) in existing OEM storage environments. The first part of the book covers topics that apply to any OEM environment. It begins with a brief overview of the benefits of using the SVC to manage virtualized storage, and identifies the large number of currently supported environments. Planning and sizing considerations are discussed, along with data migration methodologies, generic SVC migration plans, and the types of SVC migration. 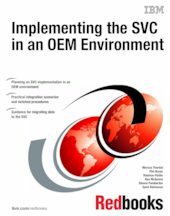 The second part of the book covers integration of the SVC in some of the most commonly used OEM storage environments from IBM, HDS, EMC, HP and NetApp. Practical scenarios are described for each environment, and step-by step details and code samples guide you through the planning, preparation, and performance of the migration. The final section presents an overview of SVC administration commands and a detailed discussion of SAN zoning, along with sample code for performing the actual zoning changes.